A view of a cottage in countryside near Lymington in Hampshire. Lymington was a coastal market town to the south west of Southampton. This is one of four views near Lymington drawn by William Redmore Bigg and published by Francis Jukes in 1795. 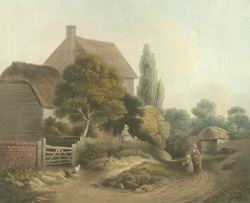 Bigg liked to drawn rural scenes with cottages, and also produced similar drawings of Essex.